High Quality Content by WIKIPEDIA articles! High Quality Content by WIKIPEDIA articles! 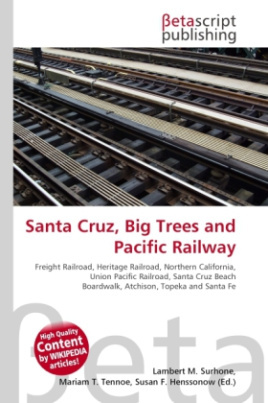 The Santa Cruz, Big Trees and Pacific Railway (reporting mark SCBG) is a freight and heritage railroad in Northern California. It uses diesel locomotives to haul excursion trains over an 8-mile route between Olympia, California and an interchange with the Union Pacific Railroad (formerly the Southern Pacific Railroad) at the Santa Cruz Wye. From there, trains continue on to the Santa Cruz Beach Boardwalk on the UP Watsonville-Davenport branchline. The SCBT&P is one of very few railroads in North America with extensive operating trackage down the middle of city streets.